Soil & Water Solutions Ltd is a licensed environmental contractor specialising in the management of contaminated and the in-situ and ex-situ remediation of contaminated soil and groundwater. Soil & Water Solutions have carried out work on a number of complex construction sites and have offered guidance to the main contractor with regards materials management. Soil & Water Solutions took the decision to operate a small fleet of vehicles in Nov 2017 and this has gone from strength to strength. This has helped Soil & Water to offer their clients a whole package, from guidance with contaminated materials to the supply of Recycled and primary products. 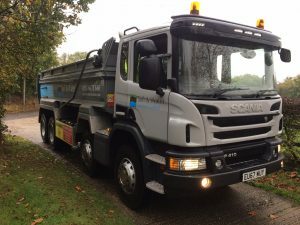 Having a fleet of tippers has helped us cover a wide range of site across the U.K.
Mark Weller, Soil & Water Solutions Limited Transport Manager and the team are very proactive about the FORS scheme which is supported by the Directors and all management at Soil & Water. The FORS scheme aligns very closely to Soil and Water’s Safety ethos. FORS is also helping to add significant value to the business through its guidance on driver training and fleet management. This has helped greatly and has had a huge impact in the correct way of operating a new fleet, we have really taken on board the FORS ethos and outlook into vulnerable road users and keeping the capitals city road safe for users. FORS has ensured we are continually working to a high standard by providing the best practice, advice, training and a safe working environment through regular industry updates, nationally and locally. We have been aware of FORS and their aims and goals for some years, but have really took on board the beliefs since gaining the accreditation and running a fleet of vehicles. We quickly realised the benefit FORS would give to our company and the strengths Transport system to continually improve on the systems already in place. Soil & Water Solutions confirms that since the company first achieved the Bronze accreditation in the early part of 2018 the transport team have further strengthened the systems to support transport operations. 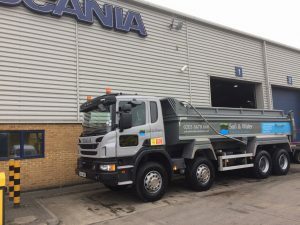 Soil And Water then moved on and implemented the structure needed to meet and gain the FORS Sliver Accreditation and now have their sights set on achieving FORS Gold standard. The accreditation has helped the business grow with some very significant contract wins and some very high profile contracts gained, many of these projects have stipulated FORS Accredited contractors in the tendering process and across the industry there has been an increase in awareness and expectation for the highly regarded ethos. It has also brought credibility and differentiated the business from competitors in a much cluttered market. FORS is communicated through all marketing promotional assets and in tendering documentation. We have introduced FORS into our induction process for all new fleet drivers. We ensure that fleet drivers are made aware of FORS and the significant benefits FORS offers. New starts are enrolled on the FORS system and are set up with their own Dashboard for E-Learning, as part of our induction we ensure that all drivers undertake the FORS Cycle safety module as we feel this is a key part to road safety and the capital’s Vulnerable Road Users. After induction we continue to communicate the importance of FORS and always ensure that we are promoting the FORS standards and the values it stands for. We feel this shows the commitment the company has to keeping the FORS Accreditations and its high standards in driver safety. We have made the progression from Bronze to sliver and are very keen to make the next steps to Gold. We are continually progressing and strengthening the transport department making it as efficient and safe as possible with the latest training and safety alerts from FORS. This is then reflected in the tendering process for new business and our customers are confident in the knowledge that we run a safe and efficient transport department reflected in our FORS Accreditations. 8 Fleet Vehicles In Total. All high-risk drivers are sent on an annual medical. It is important to us as a company to reduce noise pollution and there are many things we do for example our HGV vehicles are fitted with white noise reverse bleepers which can be switched off by the drivers during restricted hours only when a traffic marshal or banksman is in place. Soil & Water Solutions class their fleet vehicles and drivers as a major priority within the business and will continue investing in our Fleet. This will ensure we keep it as new and up to date as possible with the latest in cab technology to aid drivers in their daily roles. We ensure we keep our vehicles as environmentally friendly as possible by running a fleet of vehicles that have the latest Euro engines, this lowering our impact and C02 emissions. Gaining the FORS Gold accreditation would help show our workforce and our customers that we are committed to continually updating our Transport department and keeping our drivers up to date with the latest training and safety initiatives to benefit both us and our customers, are goals going forward are to continue the high standards that come with the Gold accreditation and keep improving year on year.